Coach In the Kitchen™ is Back! The kitchen is where life happens. We all know it. We've lived it. First when we were younger and now, as adults, we experience it over and over again. When was the last time you were at a party when the kitchen was the hub for everything else? 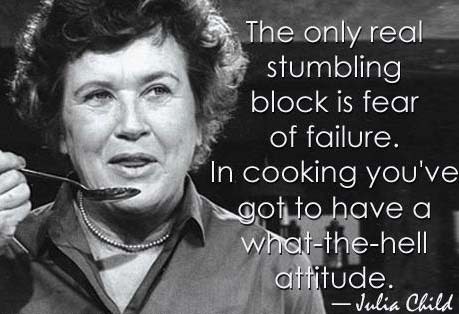 When I was growing up, Julia Child was a regular in our house. Her kitchen welcomed us in as she cooked for us and spun her homey wisdom from behind the TV screen. It would have been easy to sit at her table, sipping coffee while she cooked and talked. Comfort in the kitchen. Now, instead of the kitchen, we tend to meet at the nearest coffee shop (there's one on every corner in Las Vegas) or trendy restaurant. We have our conversations. What's missing, though, is the intimacy we once found around the kitchen table. We laughed and cried and shared secrets around the kitchen table. Major problems were discussed and solved. I started watching cooking shows on the Food Network (thank you, Darrell Evans). I started noticing more than the cooking. Each show has a very distinct feel and format. The personalities all impacted my responses to the shows. And every one of the shows was filled with life lessons and coaching moments that I could translate to the real world - the one you and I live in. My passion for Coach in the Kitchen™ was stoked and started to burn again and it was clear that Coach in the Kitchen™ was the path I needed to follow. My business is about women - working with them to grow themselves and their businesses. That happens through coaching and mastermind groups. My groups will now be run from my kitchen - one of the rooms where I spend the most time. It might be virtual, but I invite you in to join the conversations. Going forward I'll be sharing the lessons and experiences I've had in the kitchen and will save a place at the table for other women to share their own learning. Coach in the Kitchen™ IS NOT about teaching you to cook! It's all about returning to the kitchen where comfort and intimacy are easily established. Where no subject is off limits and we can get whatever we need - support, a ready ear, laughter, help, ideas, ....girl time. It's where you can talk about your business or your life and know there's no judgement. No one will laugh at you though we will share your laughter. So join me, your Coach in the Kitchen™ as we sip coffee and tea and take on life and business on our terms.